LEAH'S LIFE: The Princess got married! After coming out of the temple it was picture time. Lacey asked me to stay with her and Ryan after all of the family pictures were taken for individual pictures with her and Ryan so that I could fluff her dress and spit on her hair to slick it back down if it happened to fall out of place. I was happy to help and walk around with the princess holding the train on her dress. After the picture taking adventure, Lacey had to go back into the temple to get the remaining things from her locker. 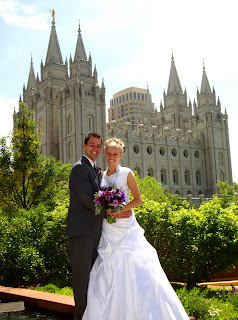 We told Ryan that we would meet him out in the front of the temple again. So, Lacey and I go through the temple to get her things. 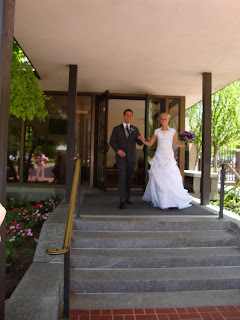 The slight problem with this is that we had to go to the desk where the newlywed couple comes out of the door because the vase for her bouquet was left there for her and we needed to pick it back up. (If you don’t know what doors I’m talking about, see the picture above) After picking up the vase, Lacey and I were trying to explain to the cute old man temple worker at that desk that we were trying to go back through the halls of the temple to get to the front desk again but that we needed directions. He kindly explained to us that we had to go through those doors (the ones that the bride and groom walk through) and walk outside back around to the entrance where were trying to go. Since we were in the temple, I felt like I couldn’t tell the temple worker that we did not want to do that. BUT since we were in a slight hurry it was just going to been faster. (Here comes the funny part because that’s what this blog is about) There was a HUGE crowd outside waiting to cheer on the newlywed couple that was going to come out next but who walks out instead? Me and Lacey, with no Ryan. I was still holding up the back of her dress, two purses, a temple bag and she was holding her bouquet, dress bag and some other things. As we walked out the doors it was complete silence and everyone looked at us really confused. Lacey announces to the crowd “We’ve already done this!” (Meaning that her and her husband have already gotten married and have experienced the “walk out of these doors celebration”) but I don’t know if everyone quite understood what she was saying because of the facial expressions of 85% of the crowd. I was almost tempted to grab Lacey and dip her but since both of our hands were already full I thought this would be slightly inappropriate. In my life, I feel that I can handle awkward situations quite well, but for some reason I was so embarrassed and I felt incredibly awkward. I don’t know why I felt so awkward, but I did. . . so I just kind of put my head down and walked as fast as I could behind Lacey though the crowd. We made our way back to the front of the temple where we met Ryan. I don’t think I have been so grateful to see him in my entire life. The rest of the day was so beautiful. It was fun walking around temple square with Lacey and Ryan. At one point, there was this one little girl in the parking garage with her parents. She just stopped in her tracks, pointed at Lacey with her mouth wide open (holding that position for about 15 seconds) in total shock of how beautiful Lacey looked. Lacey waved to her and said “Hi!” The little girl was just beside herself that such a beautiful princess was waving to her and said “Hi!” It was adorable. How happy I am to be a part of the perfect wedding and for Ryan to be a part of our family. This is my older sister Alison and my niece Annie, it was so cute that Annie held her own little bouquet. Hahahahahah .. . . Oh I think you should have done the dip. Everything looks like it was BEAUTIFUL! I love this! You have such a talent to make me laugh and cry all in one post. . only you! Thanks again for all of your help that day sisty. You are the best!